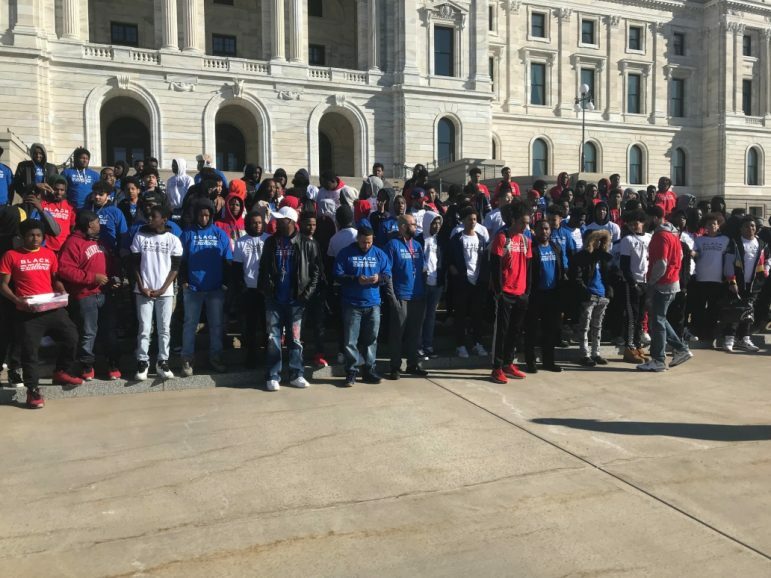 Hundreds of young Black men converged at the Minnesota State Capitol to take control of their future and change perceptions of what it means to be a Black man in America. More than 300 Patrick Henry staff, students, and their supporters, outfitted in red, white and blue “Black Excellence” t-shirts, took over the Capitol’s rotunda on March 22 as part of Patrick Henry High School’s 100 Black Men Strong day-long retreat. There, students broke into session groups in various Senate offices to give presentations on such issues as interacting with police, the portrayal of Black men in the media, and claiming political power. Trayvionne Mitchell, a sophomore, shared how quickly and thoroughly narratives, especially in social media contexts, can get misconstrued. 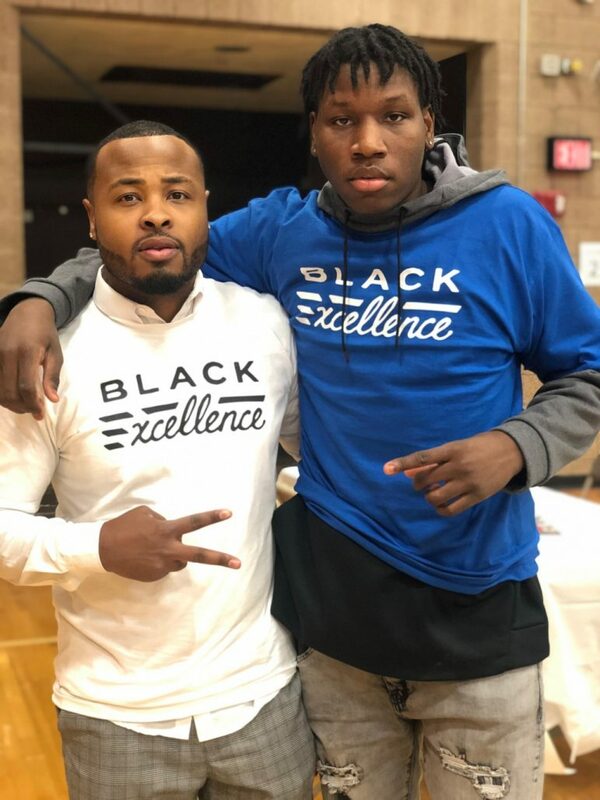 This year’s gathering was an expansion of the program that first kicked off last school year to help empower young Black male students who were happy to have the opportunity. Mitchell heard about the event last year and thought it was important. “A lot of kids noticed,” he said. Plus, he’d get to leave class for an all-day event. But, that’s where the excitement stopped and typical school-day malaise took over — it was just a series of lectures at the school. So, the kids empowered themselves and talked to Bonds about changing the event’s dynamics. “We chose to do it at the Capitol,” said Mitchell, believing the setting might dramatically invoke the students’ power to change things. Bonds said the Capitol was the perfect place to inform students of their potential political power, and the ways it is systematically chipped away. “Out of 201 legislators, only six are African American,” he said of the Minnesota House, adding students may not be aware of the disparity, or details of insidious things like Black voter suppression. Photos by Amy Villyrack Quinton Bonds (l) with Patrick Henry senior Alonzo Harmon. But, Bonds said, being at the Capitol and sitting in Senate chairs and having informed discussions, might inspire them to fill those legislative seats themselves one day. “I see myself as a leader already,” said Isaiah Smith. The junior, who is pursuing college to study business or science, contributed to the presentation on Black men claiming their political power. In his presentation, Smith reported that in North Minneapolis schools, 90 percent of the students are on free or reduced lunch and the average salary for a North Minneapolis family is under $40,000. He also shared how Black families are bumped from their neighborhoods by gentrifiers. The way out, said Smith, is to graduate high school, go to college or work, and be sure to vote in every election. “It felt really cool, felt really powerful,” added freshman Kanye Compton about meeting in the Capitol. Compton helped with a presentation on being a Black man and interacting with the police. There were police in attendance, he said, some who spoke and some who listened. Compton said he was happy to see the police and talk with them. Compton said students asked police questions, like how they feel protecting people and if they see any bias on the job. Compton said the police acknowledged seeing bias, as well as earnest efforts to right past issues. After the events, Bonds said the students are now building upon their experience to change not only how others see them, but also how they see themselves as Black men. That includes working toward building partnerships with various community organizations and government officials. “They are continually adjusting that lens through active study and community and political engagement,” he said. Let this be an annual event until the capital looks like the community. Excellent article! Thank you, Mr. Bonds, for all you do.